The historic post office in Appalachia, Virginia houses an example of New Deal artwork: a mural entitled "Appalachia". The Treasury Section of Fine Arts commissioned the work, which was created by Lucile Blanch. The mural was completed and installed in the post office lobby in 1940. Blanch was one of the few artists who actually painted WPA murals in the same town for which the work was commissioned and accepted input from local residents prior to the painting process. 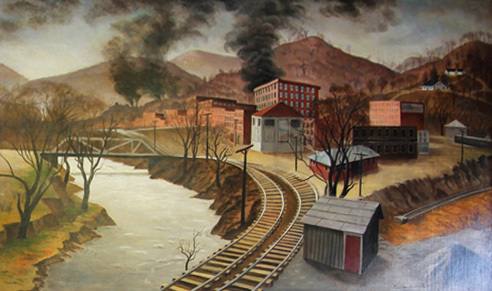 The new mural reflects a large coal/railroad scene including train cars, tunnel and a typical coal camp which depicts the town's strong heritage. Lucile Blanch was born in 1895 in Hawley, Minnesota to Charles E. and May E. Lundquist. During World War I, she studied at the Minneapolis School of Art with her future husband Arnold Blanch, and other notable artists like Harry Gottlieb and Adolf Dehn. After 1918, she won a scholarship to study under Boardman Robinson, as part of the Art Students League of New York. She also studied with artists like Kenneth Hayes Miller, Frank Vincent DuMond and Frederick R. Gruger. While in New York, she married her husband, Arnold Blanch, and they traveled to France to continue their art studies. They later moved to Woodstock, New York where they helped build the Woodstock Art colony. They divorced in 1935. She was friends with Eugenie Gershoy, who sculpted her at work. She received the Guggenheim Fellowship in 1933, and from that point on her art was collected and was shown in a number of important galleries, notably the Whitney Museum. She died in 1981 in Kingston, New York.